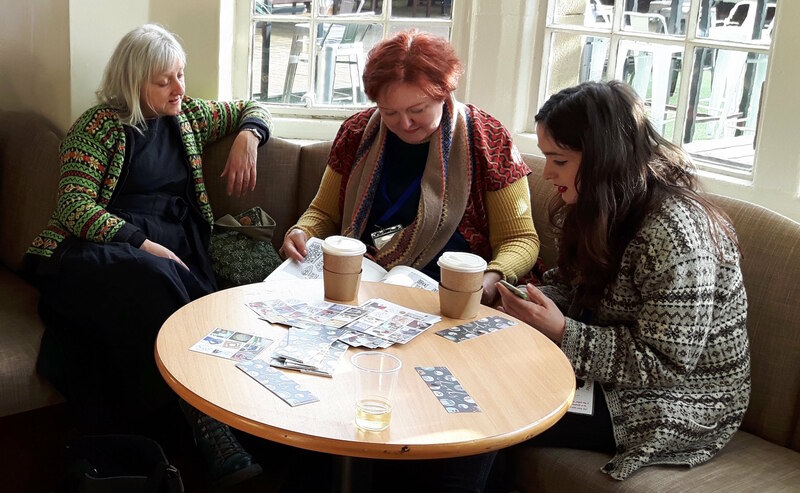 Wow, I can hardly believe it’s now 8 weeks since Edinburgh Yarn Festival and I’ve just got round to thinking back on the experience, or perhaps emerging from the thinking and trying to articulate a response. Initially it was just so overwhelming that it took a while to decompress and begin to organise my thoughts. Immediately after the event there was a deluge of reflections from some of my favourite podcasters that enabled those of us who attended the event to extend the experience, and those who didn’t, to get an insight into both the festival and Edinburgh itself. Introverts out there may relate to the gearing one self up for an event, resolving to speak to people whose work in designing, dyeing, yarn making, podcasting or writing we admire but then only achieving to do so in a very partial and patchy way and then giving oneself a hard time afterwards for not being more forward etc. For me, add on top of that the resolve to take lots of pictures to share and then after 3 days realising that you’ve totally failed to do so. In short, I find Edinburgh totally overwhelming. The venue itself; low ceilings that make the buzz of the event reverberate and very little natural light added to the numbers of people and general levels of excitement, means it adds up to some pretty serious sensory overload. But…. I love it. At this stage, rather than trying to go through the event day by day, I’ll pick out just 3 of my highlights in no particular order. I was so excited to get a place in this class. As ever the classes sold very quickly and I was there waiting at my keyboard when the tickets were released to try and get onto this class. I love Olga’s work and haven’t seen her teaching in the UK much so knew this would be a rare opportunity. The class and Olga herself lived up to, and exceeded, my excitement and anticipation. Olga is a great teacher and I have to say the geographer in me connected totally with the way Olga conceptualises and communicates her approach the minute she mentioned balancing positive and negative space. If textured 3 dimensional knitting interests you and you get the chance, I would highly recommend this fabulous class. It’s a great combination of ‘structural’ theory with an exploration of the characteristics of the materials used, both clearly explained and illustrated with the use of numerous projects and swatches and an opportunity to try it out yourself and learn by doing. 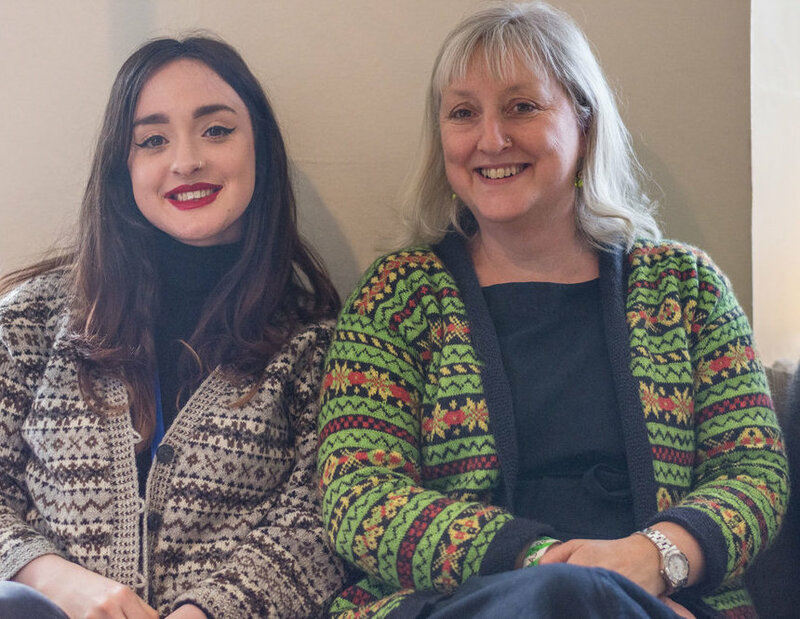 On the Friday and Saturday I spent the lunch hour at Ysolda’s pop up store with my good friend Susan Crawford and her fabulous daughter Charlie. 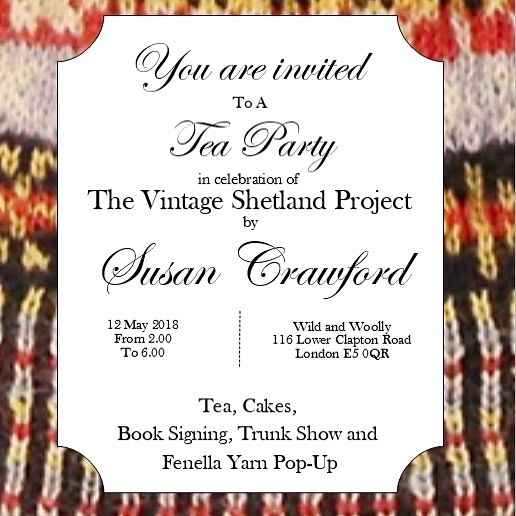 Susan was there signing copies of her newly published epic; ‘The Vintage Shetland Project’ . 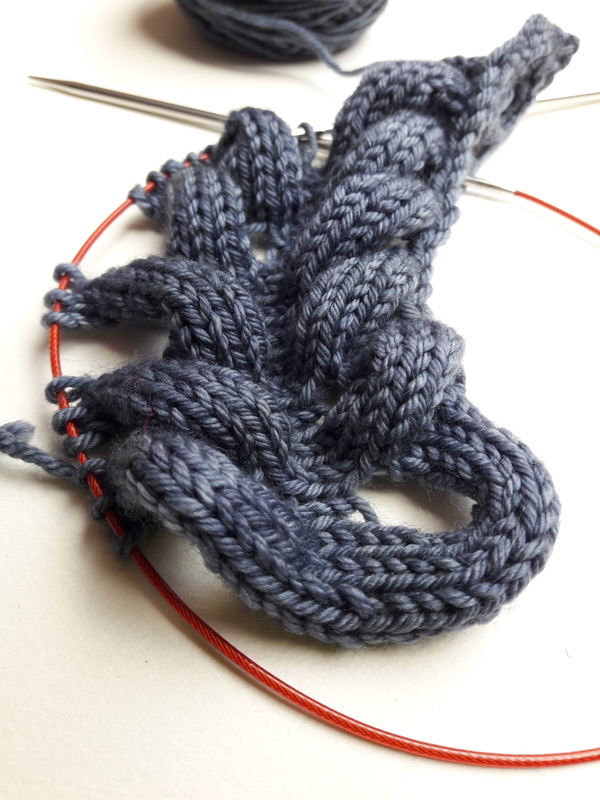 The backstory to this book is, like the book itself, vast and I’ll not go into it just now, but I was there as moral support, wearing my Vaila, knit from the proof pages of the book whilst it was being printed. It was Susan’s first outing with the book and the first major event since her treatment for cancer which I’ve written about previously, as has Susan on her blog. Whilst I think Susan and Charlie appreciated the company, I’m not sure Susan really needed the moral support and really I was able to sit back and witness the affection, esteem, awe, love and respect in which my wonderful friend Susan is held by others in our knitterly community. 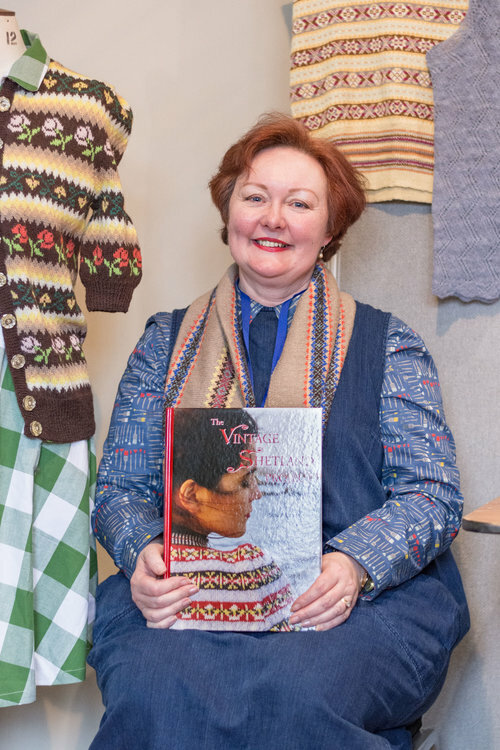 Knowing what Susan has been through to get this book to the printer and out to supporters and knitters, that was a pretty special thing to witness. In addition, I also got to me the wonderful Jeni Reid who took this picture of me and Charlie, obviously poised to lend a helping hand should one be needed. Myself, Susan and Charlie late Saturday afternoon looking through Selbuvotter and personally devoid of all energy other than that provided by the caffeine. This was an extra event introduced this year which showcased smaller producers. It ran after the main festival on the Sunday morning from 10am – 2pm. Unfortunately it was only announced after we’d bought our train tickets so we had less time at this event than we’d have liked, especially given the snow that morning and needing to make sure we still got to the train station on time. There were 12 vendors, some very local for example from the Scottish Borders and some not so, from Vermont USA, but all with one thing in common, being small farm yarn producers. I’m not sure I’ve ever seen quite so much unashamed sniffing of yarn; when people talk of yarn fumes, surely this sheepy smelling yarn has to be the most mind altering. This event was incredibly busy and it was actually quite difficult to get to some of the yarn, but you know, I persevered! 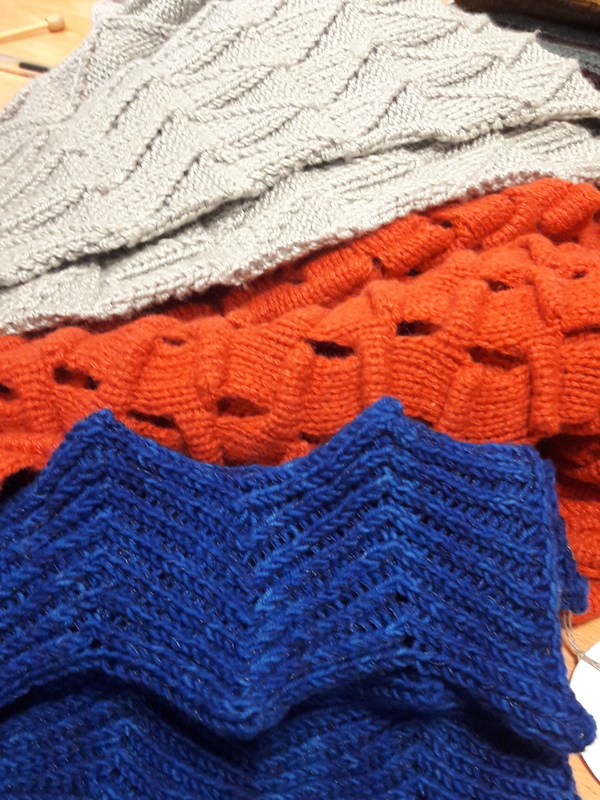 I had a lovely chat with the chap from Rosedean Ryelands and already have a plan for the yarn I bought from them. I hadn’t realised that as I was merrily chatting away, Louise from Knit British was trying to interview the other half of Rosedean Ryelands. I’m not going to work through each of the vendors but I will provide the links below and if you want to here more about this event and the stories behind the producers, please have a listen to Louise’s podcast episode which is a compilation of her interviews. Her show notes also have a little more information on the vendors and again, links. Finally, there’s one last thing I’d like to share with you from Edinburgh. 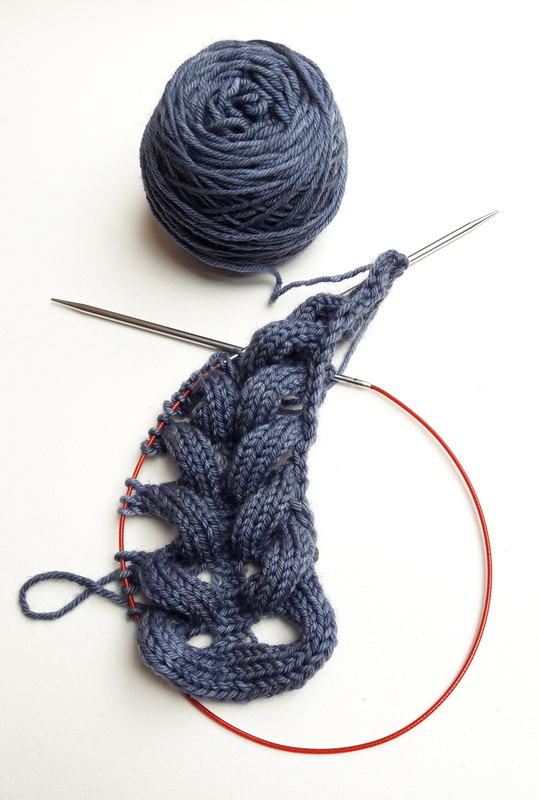 At one point in the weekend I went into the podcast lounge to sit and knit – I think I was possibly reeling a little from a significant yarn purchase… Space was at a premium and I found a free seat at a table and was welcomed to join those who were already there. We chatted about their trip and their projects and their purchases etc. and they were just lovely. One of the group went off to get a button badge for each of us from Maria of Ninja Chickens who was in the main podcaster lounge (and who does some amazing eco printing – go see). It was only later that I found out the lovely person who had been so welcoming and made me feel so comfortable joining a group of people I didn’t know (something I really appreciated) was Marceline of the Hey BrownBerry podcast. So since Edinburgh I’ve been able to spend some more time with Marce via her podcast and it’s an absolute joy, which I heartily recommend. At the end of Episode 51 reflecting on her time in to Edinburgh, Marce concludes ‘I’ve learned from this trip that our tribe embraces each other happily’, and I have to say that that’s something I learnt from Marce herself, when I stepped out of my comfort zone and sat down in that single spare chair at that table, and it’s something that I’ve been carrying with me since as I try to be a little braver! … Thank you.